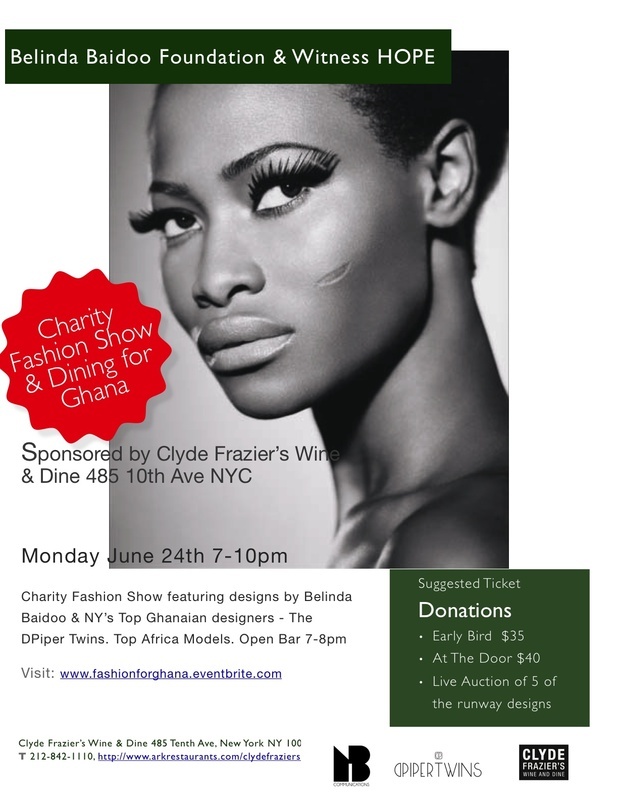 This year, the two organizations have partnered to raise money for each of their respective initiatives, through a fashion show featuring designs from Belinda Baidoo, and popular up and coming Ghanaian NY designers, the DPiper Twins. The show will feature some of Africa’s TOP models, a highlight video describing each of the organizations and the work they’re doing in Ghana, a one hour Clyde Frazier's sponsored open bar from 7pm to 8pm, a live auction of beautiful designs from both Belinda and the DPiper Twins, and 10% of the money spent on food during the night will be donated by Clyde Frazier to both charities! *Members of the press are permitted to attend the event at no charge, though a donation of any amount is suggested*. Please contact noelle@nbcommunications.us for more details. Ohemaa’s Healthcare Orphange (OHO) is an institution committed to addressing the healthcare needs of the poor and the deprived, as well as man power development among the youth within the regions of Ghana and beyond. This is accomplished by providing resources and human services, while guiding the youth in the development of their personal growth potential by enlisting in active participation through inter personal skill and professional abilities to become a positive social force in a technological interdependent society. In partnership with other schools, colleges, universities, business, private and public organizations, OHO seeks to tackle the day to day socio-economic, cultural, environmental and global challenges of the youth through education, human resource development and research.